When we say build, we mean it. We BUILD! 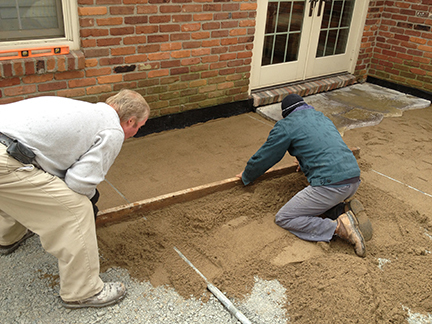 We have IN-HOUSE hardscape construction experts and craftsman who can build the outdoor space of your dreams. 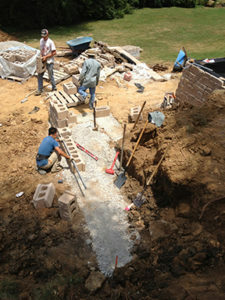 Including patios, walls, water features, grill centers, outdoor fireplaces, and complicated drainage solutions. By handling these phases of construction in-house Boone Gardiner can ensure the highest quality project is completed on time and on budget. Along with our extremely diverse nursery to pull from, we are able to handle many phases of construction with our own in house hardscape crews. We specialize in many styles of stonework including walls, patios and walkways. We install ponds and waterfalls for water gardens. We can handle grading, sod/ seed and drainage issues. With our premium network of contractors we can facilitate pool construction, deck, pergola, arbor, gazebo or cabana construction, irrigation, landscape lighting and so on. We have crew leaders who are degreed Horticulturists, Certified Arborists and Kentucky Certified Pesticide Applicators. Also, we have crew leaders that individually have over 30 to 40 years of experience. We are masters of all design styles, whether it is an English border, a Japanese garden, a contemporary art garden, a formal walled garden or simply a beautiful front yard landscape. Our desire is to create the garden of your dreams and a private retreat right outside of your home. Call 243.3832 to schedule a design consultation with one of our designers. Or fill out our Contact Form. Click here for Build Portfolio to see completed landscape projects.